Sri Lankan red chilli fish curry(Thalapath malu mirisata). Fresh Thalapath fish cooked in Lankan spices and condiments pounded in a mortar and pestle for maximum flavor. No coconut milk here so you’ll definitely feel the heat from this seafood dish. 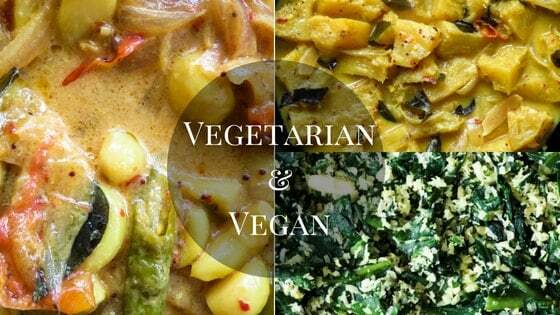 Ask any Sri Lankan and they’ll tell you, they won’t have it any other way because it’s a taste of home. 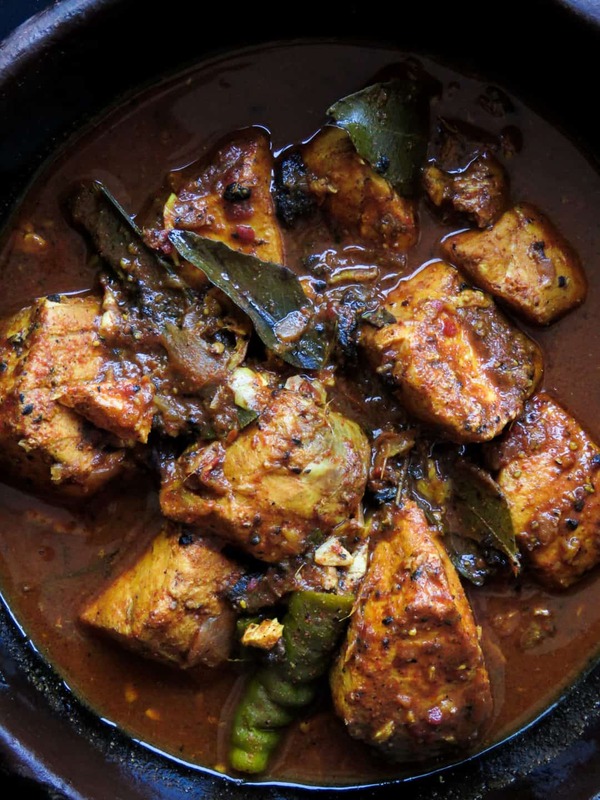 This spicy Sri Lankan fish curry(thalapath malu mirisata)curry packs a whole lot of heat and there is not a single drop of coconut milk to bring it down. Your first indication of the spiciness of the dish would be the color of the gravy which takes on a dark, deep red hue. That’s how much chilli powder we use in the dish. 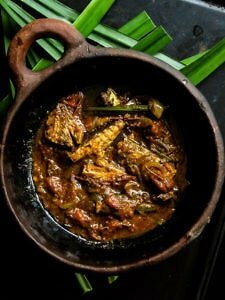 Yet, it’s one of the popular and favorite ways of cooking fish, all the flavors of an island surrounded by sea, cooked in a clay pot in typical Sri Lankan manner. Then my friend, this is THE authentic Sri Lankan fish curry to serve. 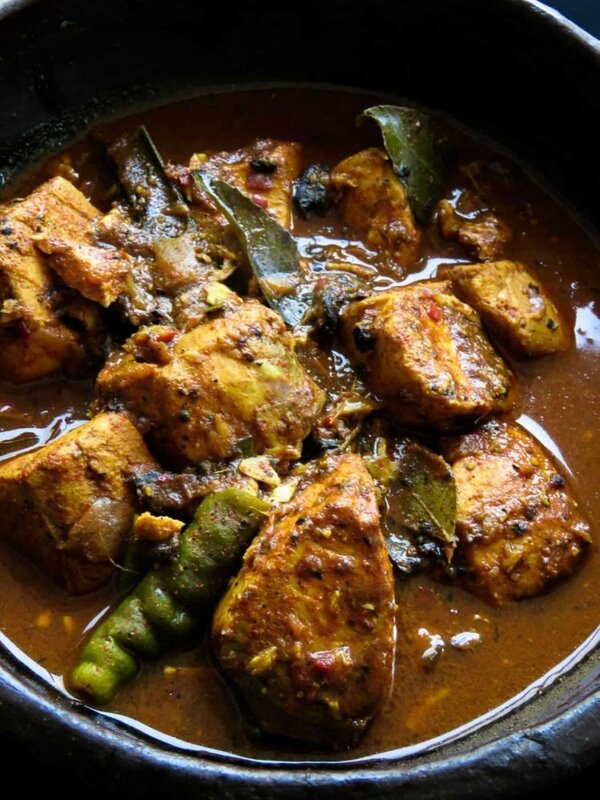 What type of fish should I use to cook the red chilli fish curry(malu mirisata)? 2/It’s firm enough to cook for a long time and not fall apart. 3/I don’t need to worry about the bones since I mostly feed teens and kids. 4/I can cook without the skin(there’s one particular child of mine who hates the skin of the fish). 5/It tastes great and cooks well with the ingredients used in this recipe. What in the world is Goraka? It’s also known as Brindleberry, Indian tamarind and in Sinhalese,”goraka”. The key taste it brings to the dish is a subtle sourness. Unlike Tamarind which gives off the same taste but is more sourer and better suited for chicken and Beef. Goraka works well in tasting seafood curries like this spicy red chilli fish curry(malu mirisata). Is there a substitute for goraka? You can definitely use Tamarind if you can’t find goraka but use it sparingly. maybe 3-4 pods of tamarind pulp to the quantity of fish mentioned here. 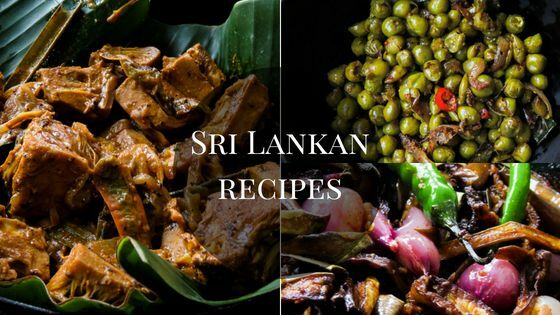 recipes to try-Sri Lankan canned fish curry. 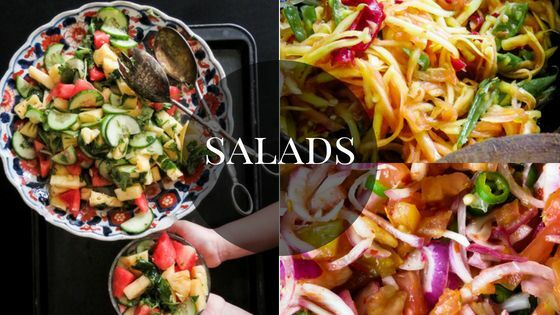 Can I add coconut milk to reduce the heat? Hmm, if you really want to stick to the original recipe, coconut milk won’t do but if there are family members who prefer non-spicy food then yes but I still can’t guarantee it won’t be spicy. 500g of fresh Thalapath(sailfish)but any firm fish with or without skin would do. In 1/4 cup of water soak the goraka pieces for 10 minutes(don’t throw the water when done). Wash the firm chunks of fish thoroughly in water with 1/2 teaspoon of salt. twice would be sufficient. Squeeze excess water from goraka and place it in a mortar with garlic, ginger, some curry leaves, shallots, cinnamon, chili powder, turmeric, peppercorns, salt to season. Pound all ingredients until you have a coarse paste. Place the chunks of fish in a medium-sized cooking pan, rub the spice paste over the fish chunks thoroughly, add 1 tablespoon of water to the mortar and collect all the remaining spices in it and pour this to the marinating fish as well. Marinate the fish for 10 minutes. Once the fish is marinated, place the pan over medium heat, add the pandan leaf, leftover curry leaves and green chilli to the pan followed by the water used to soak the goraka, cook for five minutes. Add water until it just covers the fish, cover with a lid and let the curry simmer over low heat. Try not to stir the gravy with a spoon if you feel the fish needs to be covered with the gravy, hold the pan on both sides with heat pads and slowly tilt and swirl the pan so the gravy moves over the fish, season with Salt if necessary. Cook for 20-30 minutes until gravy reduces and slightly thickens. The gravy would not be thick or creamy as when you cook with coconut milk but turns to a deep color than it was, to begin with. 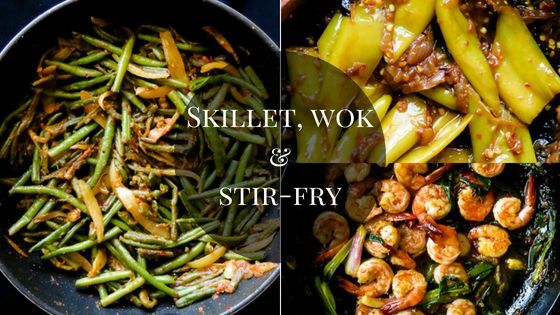 Serve warm with your favorite rice and curry dishes. 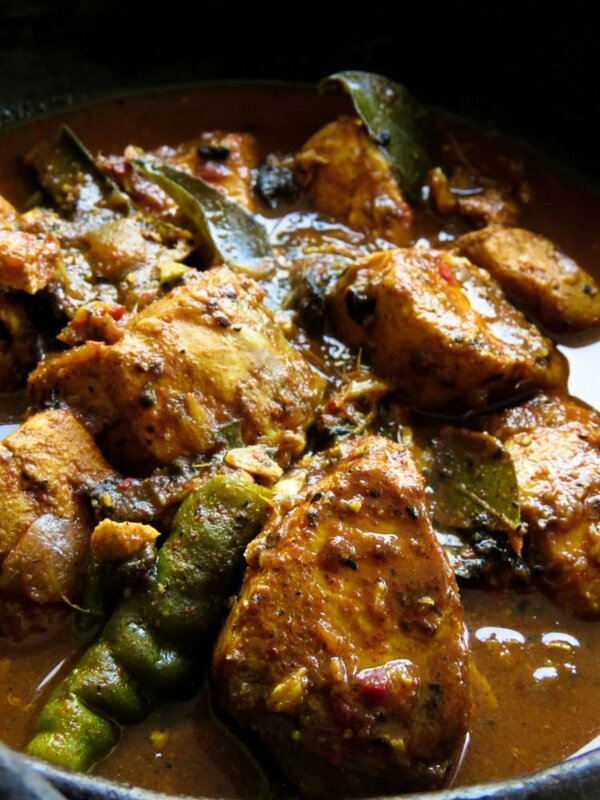 SRI LANKAN RED CHILLI FISH CURRY(MALU MIRISATA). FRESH THALAPATH FISH COOKED IN LANKAN SPICES AND CONDIMENTS POUNDED IN A MORTAR AND PESTLE FOR MAXIMUM FLAVOR. NO COCONUT MILK HERE SO YOU’LL DEFINITELY FEEL THE HEAT FROM THIS SEAFOOD DISH. ASK ANY SRI LANKAN AND THEY’LL TELL YOU, THEY WON’T HAVE IT ANY OTHER WAY BECAUSE IT’S A TASTE OF HOME. 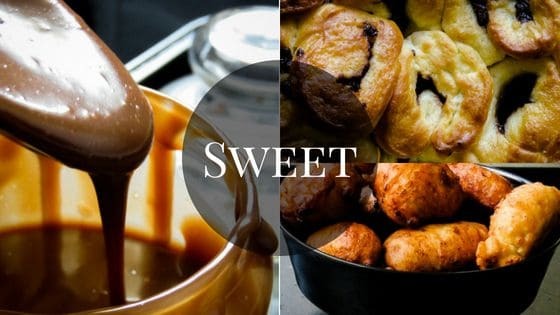 Cook for 20-30 minutes until gravy reduces and slightly thickens, the gravy would not be thick or creamy as when you cook with coconut milk but turns to a deep color than it was, to begin with.